Installation. 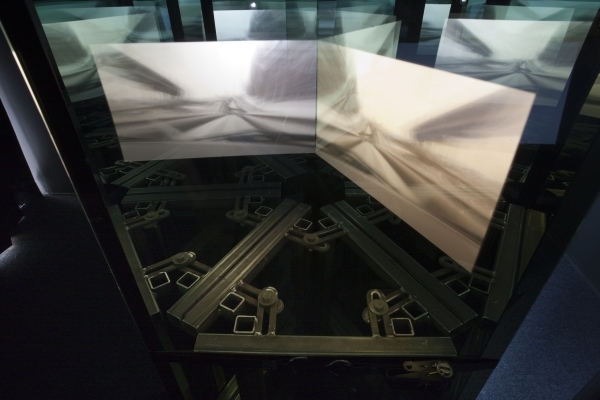 Two synchronised HD projections with sound, mild steel support structure, 3 two-way mirrored glass panels, mylar & sound. A mild steel and 'two-way mirror glass' structure stands in the centre of a totally dark room. Two synchronised projections alternate. One, shot from the passenger seat of a car travelling through a multi-level highway interchange, is projected onto one of the structure's two-way mirror panes, generating a series of dynamic crystalline reflections of reflections. The other video is projected onto a tilted wall and accompanied by a low rumbling soundtrack which builds to a crescendo before cutting abruptly to silence when the gesturing performer disappears. 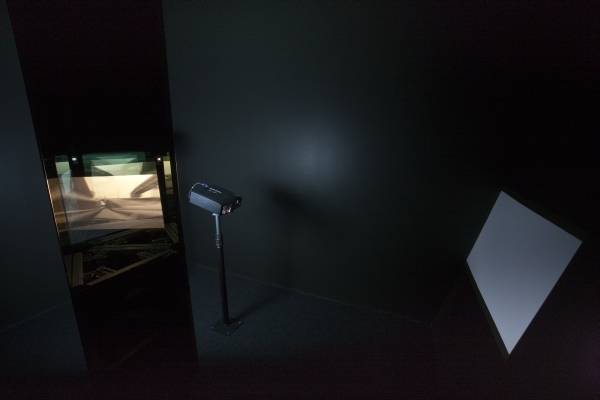 Projected from first principles was created while on a residency at The Mattress Factory in Pittsburgh in early 2010 and exhibited as part of the group show Nothing is impossible which was curated by Mark Garry and Georgina Jackson. The video below combines both spatialised videos into a single file. It's important to remember that the video shot from a car was kaleidoscoped as a result of projecting it through the two-way mirror structure.